Bad news coffee drinkers. Despite some findings that coffee does not affect health adversely, a survey of 1000 coffee drinkers and non coffee drinkers who own life insurance, commissioned by Life Ant, has found that on average, the coffee drinkers are paying more for their life insurance than their non coffee drinking counterparts. The survey found that the average coffee drinkers pay almost a staggering 20% more money for equivalent life insurance coverage. 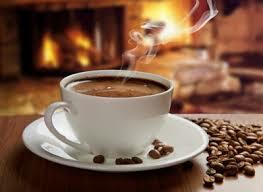 We found that the mean life insurance cost for a coffee drinker is $19.24 for their term coverage. Non coffee drinkers are paying $15.98 for the equivalent coverage. The landmark Aljunied-Hougang Town Council (AHTC) trial centers around the alleged mismanagement of public monies by Workers' Party (WP) leaders. Since so much attention, effort and money that has gone into this matter since 2012, I couldn't help but wonder — what was the scale of WP's alleged mismanagement relative to AGO's audit findings for all government agencies? This articles hopes to summarize 5 years' worth of AGO reports (and perhaps several weeks' worth of time of reading them) into a 5-minute article. Mr Shanmugam (above) criticised AHTC chairman Pritam Singh "for suppressing the truth (designed to mislead) both in Parliament and in Court"
In a strongly-worded FaceBook post, he called on WP's 6 elected MPs to come clean on millions in irregular payments in its "dark corners", sums that were flagged by independent auditor KPMG in its report on WP-run Aljunied-Hougang Town Council (AHTC) last week. 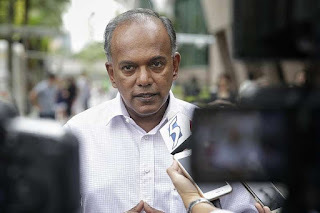 Home Affairs and Law Minister K Shanmugam on Sat (Jul 23) said accounting firm KPMG’s 4th monthly report on the Aljunied-Hougang Town Council (AHTC) paints “a devastating account of the Workers’ Party’s mismanagement of its town council”. In a FaceBook post, Mr Shanmugam described the findings as “a damning litany of highly irregular & suspicious financial practices, poor governance structures and extensive leadership failures”. 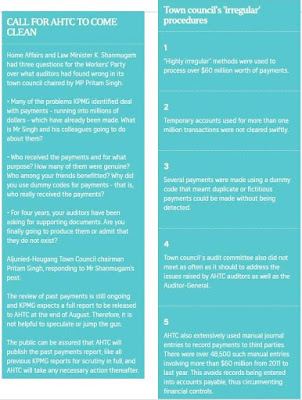 The KPMG report, which was made public by AHTC late on Wed night, uncovered lapses in its audit of the town council. KPMG had said AHTC would need "at least 18 months" to fix lapses uncovered by the firm. It also stated that it found a further 70 control failures within the town council, in addition to the 115 control failures earlier identified by the Auditor-General's Office. 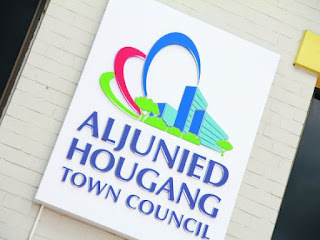 The latest monthly progress report on Aljunied-Hougang Town Council (AHTC) issued by KPMG paints a devastating account of the Workers’ Party’s mis-management of its town council. It is a damning litany of highly irregular and suspicious financial practices, poor governance structures & extensive leadership failures. There was no “culture of compliance to controls”. 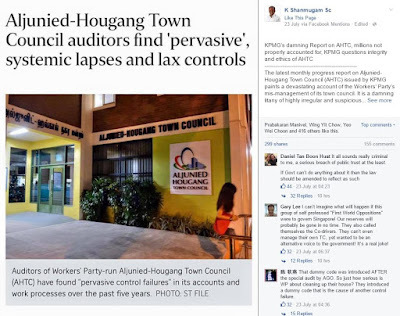 Not only does the latest report by KPMG on Aljunied-Hougang Town Council (AHTC) show that “the rot is at the top”, the town council’s breezy response to the report shows no sense of responsibility, said Home Affairs and Law Minister K Shanmugam. KPMG’s latest monthly progress report had identified an additional 70 “control failures” in the town council’s governance, financial control and reporting, procurement, and records management over 5 years, and also flagged a “pervasive” culture of systemic weaknesses. 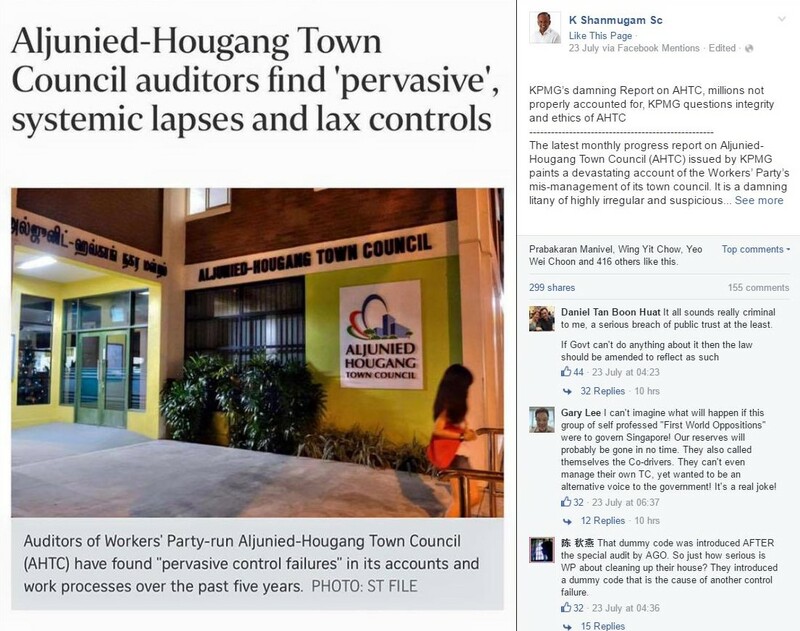 In a FaceBook post on Sat (Jul 23), Mr Shanmugam took issue with a statement from AHTC chairman Pritam Singh. 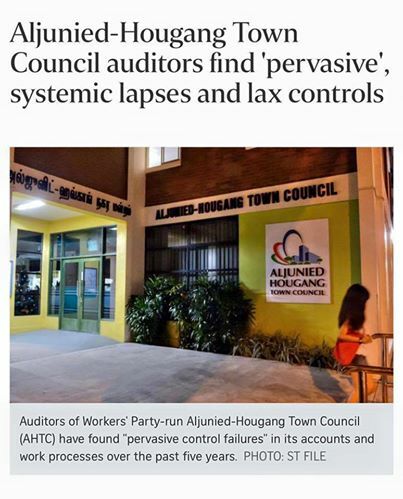 Auditors of Workers' Party-run Aljunied-Hougang Town Council (AHTC) have found "pervasive control failures" in its accounts and work processes over the past 5 years. These weaknesses cover key areas of governance, financial control, financial reporting, procurement & records management. In a report yesterday, KPMG also found that the town council's management lapses went beyond individual issues and were a systemic problem. Auditors of the Workers' Party-run Aljunied-Hougang Town Council (AHTC) had harsh words for the way it was managed, saying they found "pervasive" control failures in its accounts and work processes over the past 5 years. 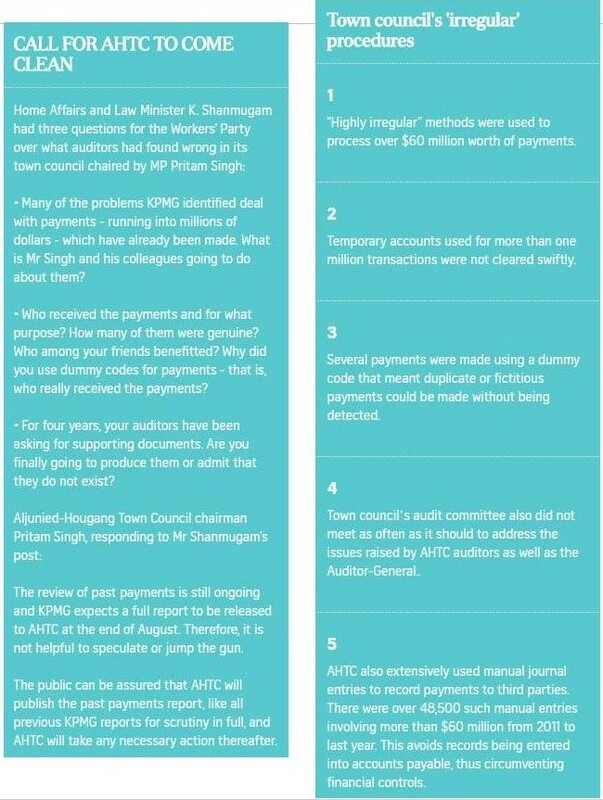 In all, KPMG flagged 6 areas where AHTC's control environment had failed to set the foundation for discipline and structure for its internal workings. These include the lack of communication and enforcement of integrity and ethical values. 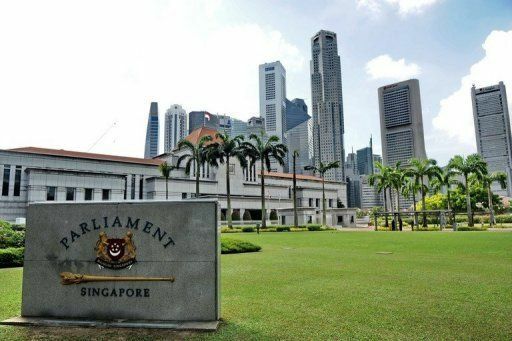 The Workers' Party on Mon (Aug 1) said that the multiple lapses in public sector spending and governance flagged in the Auditor-General's Office report released last Tuesday are "matters of grave public concern" & should be adequately addressed by the Government. The Opposition party said in its press release that of particular concern are "recurring lapses taking place under one ministry". 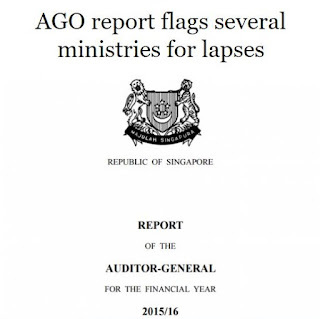 Referring to the lapses reported of the Ministry of Education, the WP said that more than half of the scholars selected by the AGO for test-checks failed to fulfil their scholarship obligations to Singapore, as well as the "worrying trend" in the pattern of lapses in procurement, tender & giving preferential access to a related party across several institutions. KPMG: Root causes of AHPETC lapses created by government's Town. Cleaning up the Town Council Act. It's about time! 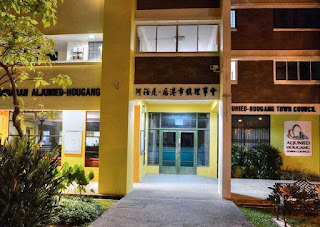 AHPETC: Lawless in Aljunied or WP Laws in Aljunied? We know that brown is better when it comes to grains, but what about eggs? The only difference between brown and white eggs is the price. 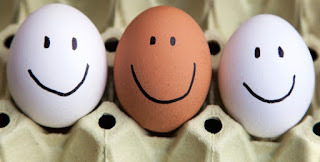 Both brown and white eggs have the same nutritional profile and are graded the using the same scale. So, why are some eggs brown and others white, and are brown eggs worth the extra money? It's All About The Chicken - You might assume that white eggs are laid by white-feathered chickens and brown eggs by brown-feathered ones, and you would be somewhat correct with that assumption. The color of the chicken does play a role, but it is the color of the earlobe that determines the shell color. White or light-colored lobes indicate white eggs and chickens with red lobes produce brown eggs. More Expensive Does Not Mean Better - If you think that brown eggs taste better, it has nothing to do with the shell color and everything to with what the chicken are being fed. And because chickens with red lobes tend to be bigger, they eat more. This is the main reason that they are more expensive. In addition to the quantity of food the chicken eats, the quality is an important factor. The quality of the feed can impact the taste but if you give the same quality feed to both lobe colored chickens, the eggs will taste the same. Regardless of shell color, size or even grade, the most important thing about eggs is that they can and should be part of a healthy diet. Eggs contain the highest biological value for protein. One egg has only 75 calories but 7 grams of high-quality protein, 5 grams of fat and 1.6 grams of saturated fat, along with iron, vitamins, minerals, and carotenoids. And it's important to eat the yolk because the essential fatty acids vitamins A, E, D and K, as well as most of the calcium, iron and folate are found there. 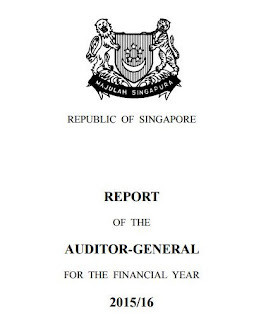 The Report of the Auditor-General was signed on 14 July 2016 and submitted to the President of Singapore. The Auditor-General's report for Financial Year 2015/16 was released on Tue (Jul 26), and it uncovered instances of inadequate financial controls over Government operations and weak governance. In a media release, the Auditor-General's Office (AGO) said that, as a whole, it audited the Government Financial Statements -- incorporating the accounts of all 16 Government ministries and eight organs of state -- and the financial statements of 3 statutory boards, a Government fund, 5 Government-owned companies and 3 other accounts. Selective audits were also carried out on 9 statutory boards and 3 Government funds. 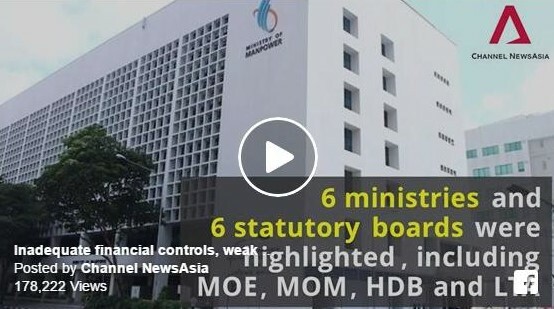 The audit observations in this year's report relate to 6 ministries, including the Ministry of Education and Ministry of Defence, and 6 statutory boards such as the Housing and Development Board (HDB) and Nanyang Polytechnic, AGO said. In its latest report for financial year 2015/16, the Auditor General’s Office (AGO) flagged lapses and inadequate financial controls in 6 ministries and 6 statutory boards. 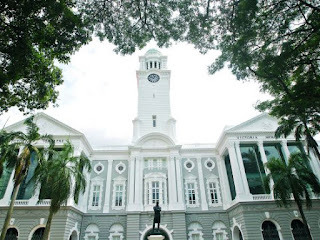 These ranged from investments made without proper approval and evaluation by the Ministry of Defence, to the National Arts Council paying a consultancy fee of S$0.41 million for the construction of a bin centre that cost S$0.47 million. When 2 universities failed to recover tuition-fee and study loans given to their students within a specified period,the Ministry of Education (MOE) did not take the necessary follow-up actions promptly. 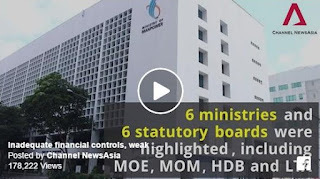 Called out for its lack of oversight in administering schemes and programmes such as scholarship bonds and study loans, the MOE was 1 of 12 government bodies whose lapses were flagged by the Auditor-General’s Office’s (AGO) annual audit of the public sector. Others cited for lapses in the AGO’s 61-page report, made public on Tue (Jul 26), included the Defence Ministry (Mindef) and the Housing and Development Board (HDB). After the report is submitted to the President and presented to Parliament, the Public Accounts Committee will deliberate on the report and may call upon the public sector entities to account of lapses where it deems necessary. The Auditor-General's Office (AGO) released its report for the financial year 2015/16 on the proper accounting, management and use of public resources on Tue (Jul 26). The Auditor-General has signalled his concern over weak governance of public funds in several government agencies, and "lax" oversight of external entities tasked to administer schemes and loans. 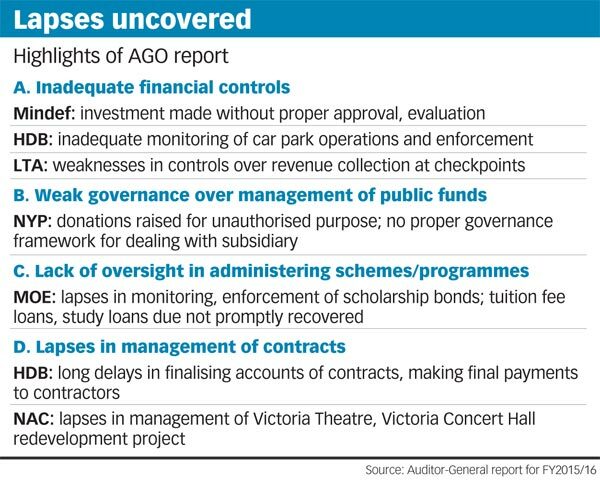 These weaknesses in governance were set out in the latest annual report of the Auditor-General's Office (AGO) released on Tue (Jul 26). Most notable was poor oversight found in Ministry of Education (MOE) funded tuition fee loans, study loans and scholarships which are administered by the Nanyang Technological University (NTU) and the National University of Singapore (NUS). 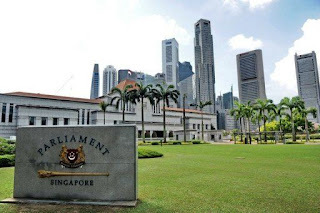 Presented to Parliament on Tuesday, the Report cited the Ministry of Defence, Central Provident Fund Board, National Library Board, Media Development Agency and National Parks Board, among others, as ministries and statutory boards where the lapses occurred. The audit involves checks for waste, excess and financial irregularity in government ministries and in the use of government funds through test checks -- which may not reveal all lapses. 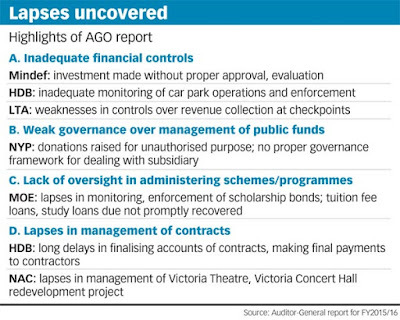 In its report, the AGO stated that the irregularities do not necessarily reflect the general state of administration but serve as “pointers” to areas where improvements should be made. 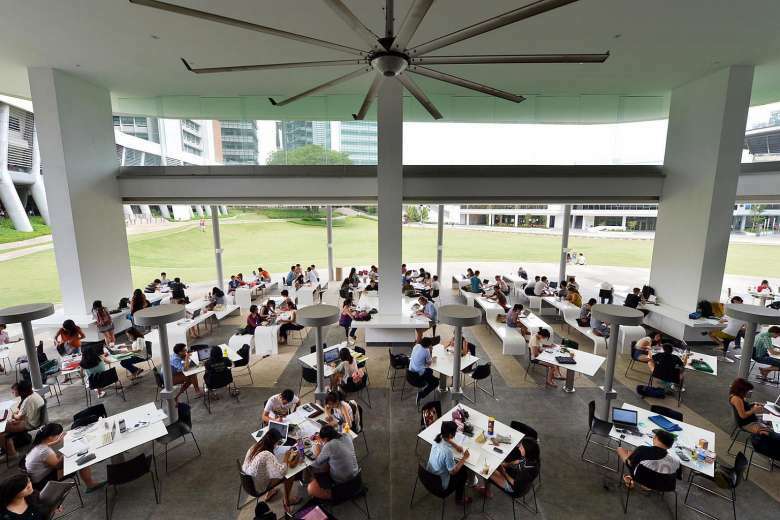 Nanyang Poly gave $8.38m in "hidden subsidies, excess funds"